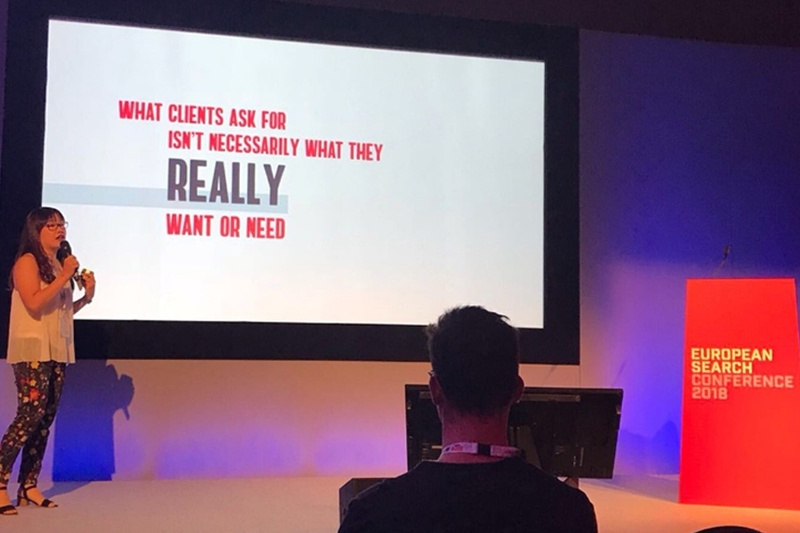 Hosted in Liverpool on 22nd June, the European Search Conference was an event not to be missed for anyone in the business of search marketing, with a packed schedule of talks from agencies and in-house brands. It was an incredibly informative and inspiring day, hearing from other leading professionals about their experiences, learnings and predictions for the search landscape, so we thought we’d share some of our highlights. Find all the updates on Twitter through the #EuSearchCon tag. As technologies become more advanced, migrations are becoming more in demand to get websites up to date. Aleyda spoke about the best practices and went into detail on great processes to achieving a smooth migration. There are different types of migration that have different goals and therefore will have different processes. There are still websites getting up to speed with the HTTPS protocol, which is becoming more important every year. Switching to HTTPS is a straight-forward process. However, if the information architecture of a site is changing then this is a bigger deal. Migrations can be great opportunities for growth, giving you the chance to fix navigational and structural issues. However, all migrations can still have a negative impact on visibility, especially if not prepared for. But what if the migration has been conducted before the SEO impact was taken into consideration? Not to worry, Aleyda had us covered. We simply reverse the process and find the pages that were performing and now are not. Do the pages exist? Are old URLs redirecting? What has changed on-page? Answering these questions will get you on the road to fixing the issue. In Lukasz Zelezny’s 20-minute talk he shared some useful tips to help with your social media presence. His insights covered a range of topics, including gaining more links through social media, building connections through topical research, engaging with your audience and scheduling your content ahead of the game. Always stay on track of your brand. Communication is important for your social reach, which could land you with a couple more pieces of coverage and more sales than you think. Lukasz recommends using Brand24 to track your brand. There is a fee for this tool, but it could be worth it with the results you collate – you are able to track keywords and access the number of mentions / likes / shares / comments in the given time frame. Using the Brand24 tool can help with your link-building tactics. By searching for your Twitter handle you can view who is mentioning you in tweets and even search across Google to view sites who have mentioned you without including a link. It also helps you to view a social media channel’s reach/domain authority to understand if it’s worth linking to. Lukasz advised using Buzzsumo for researching topical content. By searching for the related keyword, this tool will pull in all the blogs written containing that information. It also provides information on social shares, total page engagements, number of links, etc. to determine whether you want to post this content yourself and to keep an eye on your own content to see if you have been mentioned anywhere without gaining a linking. If you can interact with influencers, brands with a large following or even just big brands in general, this will allow you to jump on their interaction, giving you a little bit of the limelight. For example, if you spot an opportunity to start a conversation on Twitter to speak to other, this can then gain traction for your profile. Remember to always use a hashtag for more reach. Whatever work you are doing on social needs to be reported on to show its effectiveness. Lukasz suggest using the Sotrender platform, which gives insights via a dashboard report. It’s a great way to assess relevant accounts and influencers, while also providing general tips which can influence the future direction of your campaign. The tool also analyses the days you should be publishing on, taking into account factors such as the number of user activities, how many followers you have lost in a week and when your followers are most active. This will give you an overview from different profiles to help gain more traction going forward. Schedulers such as Hootsuite are great for sharing your posts across your social channels in advance when you are unable to post straight from the platform. By using a scheduler, you can plan your posts in advance to share engaging messages to your audience without having to research every day. This gives you more time to focus on other things. For example, sharing a post around a national day or event to show awareness even if you’re not attending may help you to communicate at the right time. Always remember to use a hashtag to allow your audience to find your post easier and allow them to engage. Communication was key in the talk from Distilled’s Senior Designer Vicke Cheung, which took us through a step-by-step process for getting the best out of your creative team. Of particular importance was a point that will resonate with many agencies – the need to always question the brief. This is crucial to avoid disparities between what clients ask for and what they actually want or need; setting and adhering to a focused KPI is the best way of ensuring that your work achieves what it sets out to do. Make sure you keep the research process as open as possible. Inspiration documents and mind maps will always be invaluable, but don’t forget that lightbulb moment can come from anywhere. Talk to as many people as possible about your idea, in or out of the office – because conversation costs nothing! Once you’ve hit upon your shortlist of ideas, Vicke advises using your instincts to find the best one. Finding a knack for predicting the most successful idea can be as simple as what she terms “The Ooh Effect” – judging everyone’s initial reaction when you pitch it to the team. Always remember: successful content elicits emotion! It isn’t enough to just have a great idea, though – it also needs to be as shareable and promotable as possible. This is certainly something which we have to consider with every piece of work we do on the Earned Media team here at Return. We always keep in mind that journalists love both exclusive content, and video content. Vicke advises doing little and often, creating smaller pieces to reduce risk and maximise your return. When you have that great idea, don’t be afraid to repeat it for future campaigns! And of course, shout about your successes – share, share and share again, instead of waiting for others to do it first. New technologies are rising at speed and digital marketers need to keep up with the latest. Like all new technologies, there are a lot of challenges and a lack of data to establish best practices. The way people use technology is changing. Assistive systems are everywhere, from assistive cars to Google Home and mobile phones. This means the locations where people conduct searches, the activities they’re conducting and ultimately the way people are searching are diversifying. So how do we optimise for voice search? Even though Google Search Console still isn’t providing voice search data, from the data we do have it’s clear that we should be maximising on conversation search and conversation action-based targeting. From creative campaigns that win high-authority links to innovative technical work that’ll boost your rankings, Return is always at the cutting edge of digital marketing developments. Find out what we can do for your business today.